Simulyze, Inc., a leading provider of operational intelligence (OI) technology and applications that empower both federal and commercial organizations, today announced the successful deployment of its Mission InsightTM OI application in support of the National Aeronautical and Space Administration’s (NASA) Technical Capability Level 2 (TCL 2) National Campaign testing of unmanned aircraft systems (UAS), held May 15-June 9, 2017. Simulyze directly supported operations at two of six participating Federal Aviation Administration (FAA) UAS test sites with its enterprise-level solution that integrates and visualizes all aspects of multiple flight operations into a single interface. NASA’s three-week TCL 2 National Campaign focused on flying small drones beyond the pilot's visual line of sight over sparsely populated areas near six of the FAA’s UAS test sites to assess NASA’s UAS traffic management (UTM) research platform. The operational scenarios simulated a variety of use cases including package deliveries, farmland surveys, search and rescue operations, railway inspections and video surveillance operations. During TCL 2, operators at the Alaska Center for UAS Integration (ACUASI), the lead organization for the Pan-Pacific UAS Test Range Complex, in Fairbanks, Alaska and the Northern Plains UAS Test Site (NPUASTS) in Grand Forks, North Dakota used Simulyze’s Mission Insight application as a workflow tool to submit flight plans, monitor aircraft status and telemetry, activate flights, transmit aircraft position data to NASA’s UTM research platform and monitor other surveillance information. During the exercise, Simulyze fielded two UAS Service Suppliers (USS) as well as USS web-based clients and extended the USS client enterprise capability it demonstrated in the previous TCL exercises to include a capability for a single client support for one vehicle operations as well as multiple and fleet operations from a single enterprise client. In its research effort, Simulyze engineers added a number of capabilities to the USS, including a coordinated operation capability that allows for multiple vehicles that are working together to share airspace, which is essential to support operations with shared launch and recover locations. They also added a capability for a vehicle to pause operations without relinquishing or replanning its airspace use, which enables a series of flights to be conducted within one airspace reservation, such as flight durations that require a battery swap between sorties. This capability was also used if a vehicle had to land for an adjustment but could quickly be returned to its flight without requiring a replan or potentially losing the airspace reservation. Working with ACUASI and NPUASTS, Simulyze demonstrated and tested simultaneous operations in close proximity. The USS and the overall UTM system were exercised under nominal and off nominal flight conditions and Simulyze successfully exercised interactions with operations that went outside of their flight volumes and/or data reporting timelines. The USS notified the violating operator and notified other operators in the area. Research was also conducted to provide ground based sense-and-avoid warnings of other aircraft. Simulyze engineers made a number of human factor updates to support operations so that UTM functions can be integrated into the flight sequence without impacting flight operations. Other human factor updates included providing pilots and operators with real-time audible and geospatial information to support safe flight operations. In April 2016, Simulyze’s Mission Insight application was successfully deployed in support of NASA’s TCL 1 National Campaign UAS testing, which was the first nationwide test of air traffic management for drones. Simulyze directly supported operations at two of six UAS test sites. In June 2016, Simulyze successfully deployed Mission Insight in support of the first U.S. ship-to-shore drone delivery. Taking place on the New Jersey coastline, the event featured independent drone delivery service Flirtey and the Johns Hopkins University School of Medicine demonstrating the potential use of UAS to deliver medical supplies during a natural disaster or humanitarian crisis. Simulyze also successfully deployed Mission Insight to support two flight operators in NASA’s TCL 2 flights in Reno, Nevada last October, and was one of five industry partners who participated in the NASA-FAA Research Transition Team (RTT) Data Exchange and Information Architecture (DEIA) working group (DWG) Demonstration 1 last November. Simulyze has a Space Act Agreement with NASA in support of its UTM that runs through December 2019. The company’s partnership with NASA’s Ames Research Center is focused on the research and development of a UTM system to enable and support safe and effective UAS operations. Simulyze, Inc. is a leading provider of operational intelligence (OI) technology and applications that empower both federal and commercial organizations to make better, more strategic decisions in real-time. Built on its OI platform, Simulyze’s flagship product, Mission Insight™, is the industry’s leading commercial off-the-shelf (COTS) application that makes complete situational awareness easy to attain and easy to deploy. It processes and analyzes large streams of data from disparate sources to provide air, land and sea operators, commanders and managers with a common operating picture (COP) in a customized graphical interface. Since 2000, Simulyze’s OI technology has been deployed across numerous organizations worldwide, including the Department of Defense, the U.S. Intelligence Community, the Department of Homeland Security and commercial UAS applications. For more information, visit http://www.simulyze.com and follow on Twitter: @Simulyze. 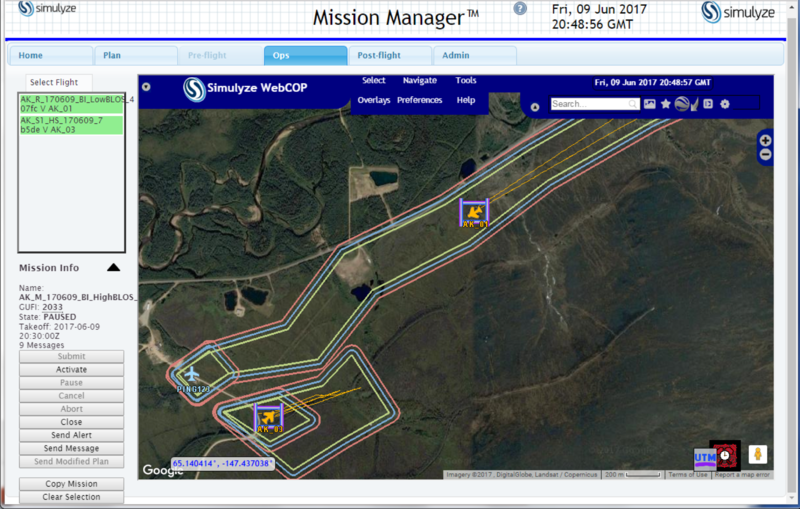 Image 1: NASA Technical Capability Level 2 National Campaign, Alaska UAS Test Site, June 9, 2017: Screenshot from Simulyze’s Mission Insight application shows two aircraft flying in close proximity, one of which is beyond visual line of sight operations. 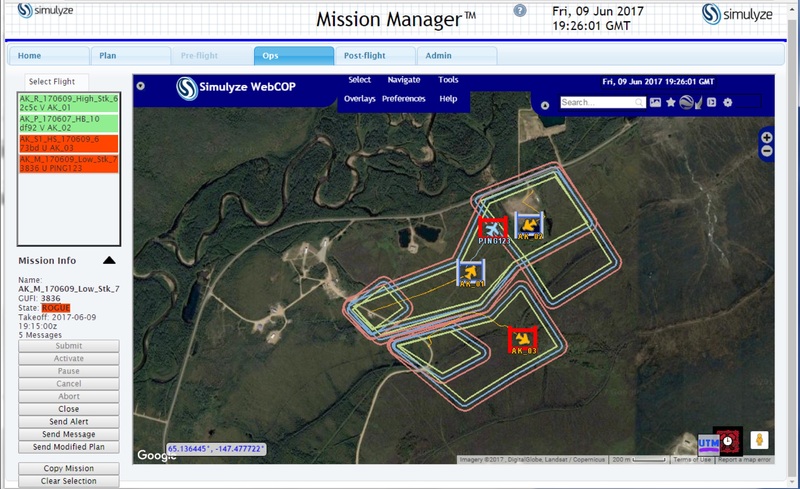 Image 2: NASA Technical Capability Level 2 National Campaign, Alaska UAS Test Site, June 9, 2017: Screenshot from Simulyze’s Mission Insight application shows four aircraft flying in close proximity, including beyond visual line of sight operations; two of four UAS are shown operating outside of their respective flight volumes, and notification is sent to the violating operator as well to other operators in the area. Image 3: NASA Technical Capability Level 2 National Campaign, Northern Plains UAS Test Site, June 8, 2017: Screenshot from Simulyze’s Mission Insight application shows four aircraft flying in close proximity, including beyond visual line of sight operations. Image 4: NASA Technical Capability Level 2 National Campaign, Northern Plains UAS Test Site, June 8, 2017: Screenshot from Simulyze’s Mission Insight application shows four aircraft flying in close proximity, including beyond visual line of sight operations; one UAS is shown departing its approved flight volume, and notification is sent to the violating operator as well to other operators in the area.